The American Curl cat’s history begins in June 1981 in California, where Joe and Grace Ruga found a stray kitten that had long, silky hair. What was unusual about this kitten was its ears – the tips were curled backwards. This kitten was called Shulamith and all American Curl cats can be traced back to her. Shulamith had her first litter of kitten in December 1981 and two of the kittens had the same curly ears. 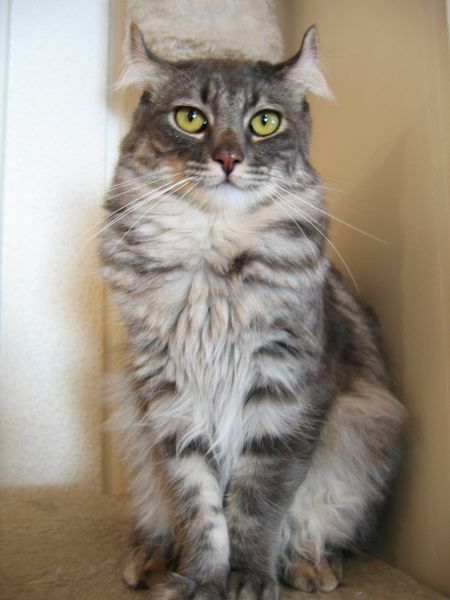 During 1983 cat fanciers started to develop a selective breeding program to conserve the curly ear gene and to develop a breed based on this gene. 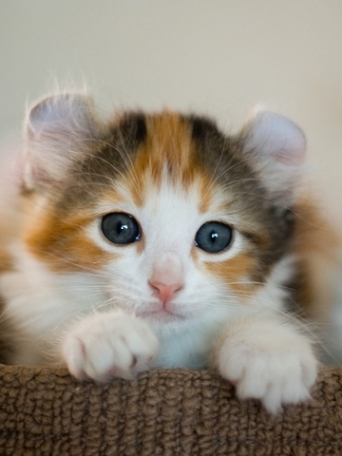 Renowned English feline geneticist, Roy Robinson analyzed data from 383 kittens from 81 litters, and working with breeders, confirmed that the curly ear gene was unique and an autosomal dominant gene. This meant that any cat that has even one copy of this gene will have the curly ears. The foundation for a new breed of cat was established when Roy Robinson published an article in the Journal of Heredity in December 1989. He stated that he found no defects in any of the crossed analyzed. The American Curl is a native breed to America and is a medium-sized cat. The ears curl out and backwards making the cat look alert with a happy expression. The coat of the American Curl comes in either short-hair or longhair varieties. There is little undercoat which means that very little grooming is required. 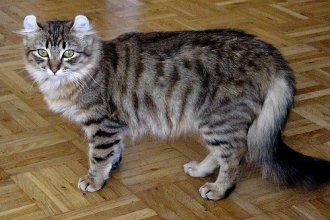 Coat colors are varied – from black through to mackerel tabby. The ears are the main feature of this cat breed, but the large walnut shaped eyes are another distinguishing feature. This cat breed is medium-sized with a rounded head. They are elegant looking cats with an open facial expression. The longhair variety has a silky, shiny plumed tail. When an American Curl is born, it has straight ears. The ears start to gently unfold after about 3-5 days and at 16 weeks, the ears reach the final shape. The degree of the curl varies greatly. To maintain genetic diversity, breeders out-cross breeding with cats that do not have curled ears. Half of these out-crosses will have curled ears. The curly ear gene affects the cartilage of the ear and should be firm to the touch. This friendly cat breed is very people-orientated and wants to be in your company constantly. They get along well with children and other pets. This intelligent and curious cat is not overly talkative, but makes soft cooing sounds to attract your attention. The American Curl cat will remain kitten-like throughout its life - always looking for an opportunity to play. You will find thisYou will find this cat wherever you are and he will insist on helping you with your tasks! The American Curl The American Curl is a robust, healthy cat breed with no breed-specific problems. Do you have a story about your American Curl cat that you would like other cat lovers to hear about? Cat Breed Info is all about cats and people like you who love cats. That's why we would like to hear your stories - whether its about your princely Persian, your sultry Siamese or your mischievious Moggy, we want to hear it! Entering your story is easy to do. You can just start typing!